A classic standard perfect for any church sanctuary or member�s home. Black Hardcover. 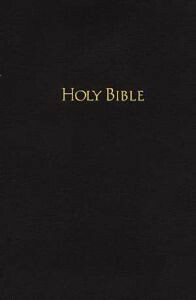 The King James Version Bible has long been trusted for use in churches and homes. Durable for years of service, the KJV Pew Bible is now available in traditional black, burgundy, and brown to complement any church�s sanctuary.